PASADENA, Calif. – A NASA spacecraft sped past a small comet Thursday, beaming pictures back to Earth that gave scientists a rare close-up view of its center. Mission controllers burst into applause upon seeing images from the flyby that revealed a peanut-shaped comet belching jets of poisonous gases. “It’s hyperactive, small and feisty,” said mission scientist Don Yeomans of the NASA Jet Propulsion Laboratory. The close encounter occurred 13 million miles from Earth when theDeep Impact craft, hurtling through space, flew within 435 miles of comet Hartley 2. It’s only the fifth time that a comet’s core has been viewed up close. Scientists are interested in comets because they’re icy leftovers from the formation of the solar system about 4.5 billion years ago. Studying them could provide clues to how Earth and the planets formed and evolved. Thursday’s flyby is actually an encore mission for Deep Impact. It set off cosmic fireworks on July 4, 2005, when it fired a copper probe that crashed into comet Tempel 1. The high-speed collision spewed a cloud of debris into space, giving scientists their first peek of the interior. After the $333 million comet-buster, NASA recycled Deep Impact for a new mission to visit another comet. It was supposed to target comet Boethin in 2008, but it was nowhere to be found. Scientists theorized the comet may have broken up into small pieces. Deep Impact was then redirected to Hartley 2. Roughly 1 1/2 miles long, Hartley 2 is the smallest comet to be photographed up close. On its way there, the craft spent several months scanning a cluster of nearby stars with known planets circling them. While its latest task lacks the Hollywood drama of the Tempel 1 crash, researchers still consider it an important mission. Unlike in 2005, viewers could not see Thursday’s comet encounter in real time since the craft’s antenna was not pointed at Earth as it flew past Hartley 2. Since September, Deep Impact has been stalking Hartley 2 like a paparazzo, taking images every 5 minutes and gathering data. It’s the first craft to visit two comets. Deep Impact will observe Hartley 2 until Thanksgiving and then wait for further instructions from NASA. Thespace agency has not decided whether to reuse Deep Impact again. The craft does not have enough fuel on board to do another flyby. The latest images add to scientists’ cometary photo album, said astronomer David Jewitt of the University of California, Los Angeles, who had no role in the project. “We’re visual animals and nothing seems wholly real to us until we have a nice picture of it,” Jewitt said. Hartley 2 passed within 11 million miles of Earth on Oct. 20 — the closest it has been to our planet since its discovery in 1986. British-born astronomer Malcolm Hartley, who discovered the comet, said he never imagined a spacecraft would get so close to his namesake find. Mike A’Hearn, principal investigator, and Jessica Sunshine, deputy investigator, discuss images from the NASA EPOXI Deep Impact spacecraft which passed within 435 miles (700 kilometers) of the Comet Hartley 2 at Jet Propulsion Laboratory in Pasadena, Calif., Thursday, Nov. 4, 2010. Comet discoverer Malcolm Hartley poses with an image from the NASA EPOXI Deep Impact spacecraft which passed within 435 miles (700 kilometers) of the Comet Hartley 2 at Jet Propulsion Laboratory in Pasadena, Calif., Thursday, Nov. 4, 2010. Project manager Tim Larson, left, watches as Michael A’Hearn, principal investigator, uses a plastic bottle to describe the rotation of the Comet Hartley 2, beneath an image of the comet made from the NASA EPOXI Deep Impact spacecraft, which passed within 435 miles (700 kilometers) of the comet, at Jet Propulsion Laboratory in Pasadena, Calif., Thursday, Nov. 4, 2010. From left, JPL director Charles Elachi, NASA associate administrator Ed Weiler, project manager Tim Larson, principal investigator Michael A’Hearn, and spectral analyst Jessica Sunshine discuss images, projected behind them, from the NASA EPOXI Deep Impact spacecraft, which passed within 435 miles (700 kilometers) of the Comet Hartley 2 at Jet Propulsion Laboratory in Pasadena, Calif., Thursday, Nov. 4, 2010. Michael A’Hearn, principal investigator, uses a plastic bottle to describe the rotation of the Comet Hartley 2, beneath an image of the comet made fromthe NASA EPOXI Deep Impact spacecraft, which passed within 435 miles (700 kilometers) of the comet, at Jet Propulsion Laboratory in Pasadena, Calif., Thursday, Nov. 4, 2010. Mike A’Hearn, mission principal investigator, discusses gas components of the comet Hartley 2 as the first images from the NASA EPOXI Deep Impact spacecraft passed within 435 miles (700 kilometers) of the comet, at Jet Propulsion Laboratory in Pasadena, Calif., Thursday, Nov. 4, 2010. Malcolm Hartley, of Australia, left, who discovered the comet, celebrates with project director Tim Larson, center, and deputy project manager Don Sweetnam after the first images from the NASA Deep Impact spacecraft, which passed within 435 miles (700 kilometers) of the Comet Hartley 2, are seen for the first time, at Jet Propulsion Laboratory in Pasadena, Calif., Thursday, Nov. 4, 2010. From left, California Institute of Technology President Jean-Lou Chameau, JPL Director Charles Elachi, and comet discoverer Malcolm Hartley, of Australia, celebrate as the first images from the NASA Deep Impact spacecraft, which passed within 435 miles (700 kilometers) of the Comet Hartley 2, are seen for the first time, at Jet Propulsion Laboratory in Pasadena, Calif., Thursday, Nov. 4, 2010. Malcolm Hartley, of Australia, the astronomer who discovered the comet, looks back from a computer image of the comet Hartley 2 after the first imagesfrom the NASA Deep Impact spacecraft, which passed within 435 miles (700 kilometers) of the comet, are seen for the first time, at Jet Propulsion Laboratory in Pasadena, Calif., Thursday, Nov. 4, 2010. Project manager Tim Larson, left, and deputy project manager Don Sweetnam celebrate as the first images from the NASA Deep Impact spacecraft that passed within 435 miles (700 kilometers) of the Comet Hartley 2 are seen for the first time, at mission control at Jet Propulsion Laboratory in Pasadena, Calif., Thursday, Nov. 4, 2010. This image provided by NASA/JPL-Caltech shows an artist’s conception of NASA’s Deep Impact spacecraft that has an appointment with comet Hartley 2 on thursday Nov. 4, 2010. The encounter will mark only the fifth time a comet has been photographed up close — and the first time two comets have been imaged by the same instruments and same spatial resolution, according to Jet Propulsion Laboratory. MOUNT MERAPI, Indonesia – A deadly surge of blistering gases cascaded down the slopes of Indonesia’s most volatile volcano Friday, torching houses in one mountainside village and triggering a chaotic midnight evacuation. At least 12 people were killed in the inferno and 50 others injured. Even staff at the mountain’s main monitoring post were told to move farther from the glowing crater. Mount Merapi, which means “Fire Mountain,” has killed 56 people since bursting back to life on Oct. 26. Though scientists earlier expressed hope dozens of big explosions in the last week would ease pressure building up behind a magma dome high up in the crater, eruptions Friday appeared to be intensifying. “We have no idea what to expect now,” said Surono, a state expert on volcanos, adding that he has never seen the needle on Merapi’s seismograph working with such intensity. Towering clouds of ash shot from the crater with a thunder-like roar on Thursday morning, sending soot 20,000 feet (6,000 meters) into the air and dusting towns up to 150 miles (250 kilometers) away. Just before midnight, Merapi unleashed a deadly surge of searing ash, gases and rock fragments. Known to experts as pyroclastic flows, such clouds race down the slopes at speeds of up to 60 miles per hour (100 kilometers per hour). Though more than 75,000 people living along Merapi’s fertile slopes have been evacuated to crowded emergency shelters, many by force, others are reluctant to leave their precious livestock and homes. It is not clear how many people were in the village of Bronggang, nine miles (15 kilometers) from the crater, when the heat cloud hit. Waluyo Raharjo, a search and rescue official, was on the scene as at least 12 bodies were pulled from burned homes. 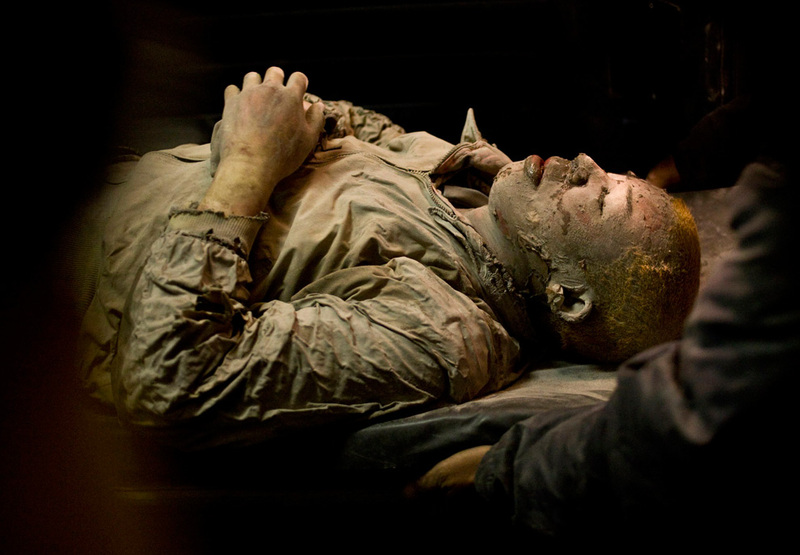 Soldiers helped load the corpses into vehicles, delivering them to a hospital morgue. A 3-year-old girl was killed in the inferno, said Pangardi, a forensic expert at Sardjito hospital, where the wounded were being treated. Priyo Sigit Utomo, a paramedic, told MetroTV another 50 people had been brought in with injuries, most of them with severe burns. It was not immediately clear if all were from the village. Activity at the mountain has at times briefly forced airports in Yogyakarta and nearby Solo to close and the Transportation Ministry reiterated Thursday that flight paths near the mountain had been shut down for safety reasons. Heavy ash and volcanic debris has been known to affect visibility and clog engines. Officials insisted, however, that a Qantas jetliner forced to make an emergency landing after one of its four engines failed over Batam, an island 800 miles (1,400 kilometers) to the west, was unrelated. Merapi has erupted many times in the last century, often with deadly results. In 1994, 60 people were killed, while in 1930, more than a dozen villages were torched, leaving up to 1,300 dead. Subandrio, a state volcanologist, said Mount Merapi’s “danger zone” was widened by three miles (five kilometers) early Friday. With that order, people living in villages and emergency camps within 12 miles (20 kilometers) of the crater have to move. Indonesia, a vast archipelago of 235 million people, is prone to earthquakes and volcanos because it sits along the Pacific “Ring of Fire,” a horseshoe-shaped string of faults that lines the Pacific Ocean. The volcano’s initial blast occurred less than 24 hours after a towering tsunami slammed into the remote Mentawai islands on the western end of the country, sweeping entire villages to sea and killing at least 428 people. There, too, thousands of people were displaced, many living in government camps. ___Associated Press writers Irwan Firdaus, Ali Kotarumalos and Niniek Karmini contributed to this report from Jakarta. Villager flee their home ride motorcycle following another eruption Mount Merapi in Klaten ,Indonesia, Friday, Nov. 5, 2010. A new eruption at Indonesia’svolcano has forced authorities to widen the ‘danger zone’ to 12 miles (20 kilometers) from the fiery crater. A view from a domestic flight from Denpasar to Yogyakarta that was subsequently diverted to Surabaya airport shows a plume of gas and ash billowing some 10 km (six miles) high from the Mount Merapi volcano during an eruption on November 4. The volcano has killed 18 people in another huge eruption, a hospital source said, as the government widened the danger zone and ordered new evacuations. 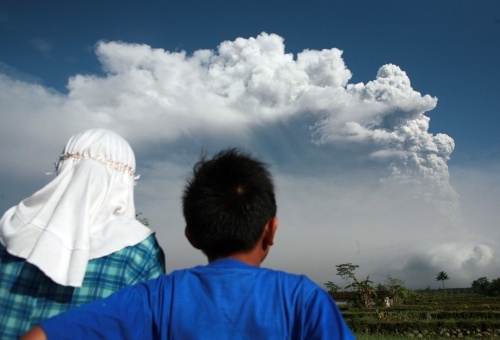 Villager flee their home on a truck following another eruption Mount Merapi in Klaten , Indonesia, Friday, Nov. 5, 2010. A new eruption at Indonesia’s volcano has forced authorities to widen the ‘danger zone’ to 12 miles (20 kilometers) from the fiery crater. Indonesian men take pictures of logs and volcanic materials carried by lahar from Mount Merapi that clogged a dam in Hargobinangun, Indonesia, Thursday. Villagers escape as Mount Merapi erupts at Serunen village, Yogyakarta, Indonesia. Villagers escape as Mount Merapi erupts in Deles village, Klaten, Indonesia. A woman flee as Mount Merapi releases volcanic materials into the air in Cangkringan, Yogyakarta, Indonesia, Monday, Nov. 1, 2010. Police officers drag a beaten up man who allegedly tried to loot from houses abandoned by their owners who fled to avoid the eruption of Mount Merapi inYogyakarta, Indonesia, Monday, Nov. 1, 2010. Metrotvnews.com, Sleman: The death toll from heat stroke clouds of Mount Merapi to Friday (5 / 11) at 8:45 pm, grew to 35 people. The body is now in Yogyakarta Sardjito Doctors Hospital in Sleman. Most were from the village of Argomulyo, namely Hamlet and Plumbon Bronggang. Members of the Regional Police DIY Syahrizal Medicine, said the possibility of the death toll could rise since there are some locations that could not be reached due to lava was still hot. “The evacuation requires heavy equipment and also the water in large quantities to get in there and evacuating casualties,” he continued. Syahrizal estimate the number of victims is greater than the eruption of Merapi on 26 October. Disaster Victim Identification Team assisted Sardjito Hospital Physicians began to identify the victim. Utha, one of the volunteers who helped evacuate, said Hamlet Plumbon destroyed by hot clouds and lava swept heat. “In Hamlet Plumbon, we find there is a family who died of heat clouds. In fact, we find there is a victim who holds a mobile phone,” continued Utha. During the activity of Merapi began to rise Wednesday, he said, it always appealed to the public to stay away from flood plains. Minimum distance, he added, 300 meters. MOUNT MERAPI, Indonesia – Blistering gas from Indonesia’s most volatile volcano spewed farther than expected Friday, incinerating houses at the edge of the danger zone, triggering chaotic evacuations and pushing the death toll in more than a week to nearly 100. Soldiers joined rescue operations in Bronggang, nine miles (15 kilometers) from the mouth of the crater, pulling charred corpses from smoldering homes and then lifting them into the backs of trucks caked in gray dust. Dozens of injured, most with severe burns, were carried away on stretchers. “We’re totally overwhelmed here!” said Heru Nogroho, a spokesman at the Sardjito hospital, as the number of bodies dropped off at their morgue climbed to 54 — the deadliest day Mount Merapi has seen in 80 years. More than 70 others were injured, many critically, with severe burns. 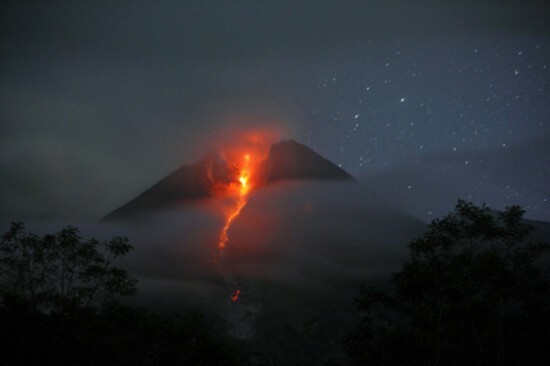 Merapi’s booming explosion just after midnight triggered a panicked evacuation. Men with ash-covered faces streamed down the scorched slopes on motorcycles, followed by truckloads of women and children, many crying. Officials barked out orders on bullhorns as rocks and debris rained from the sky.Up until Friday the village of Bronggang, home to around 80 families, was considered to be within the safety zone. 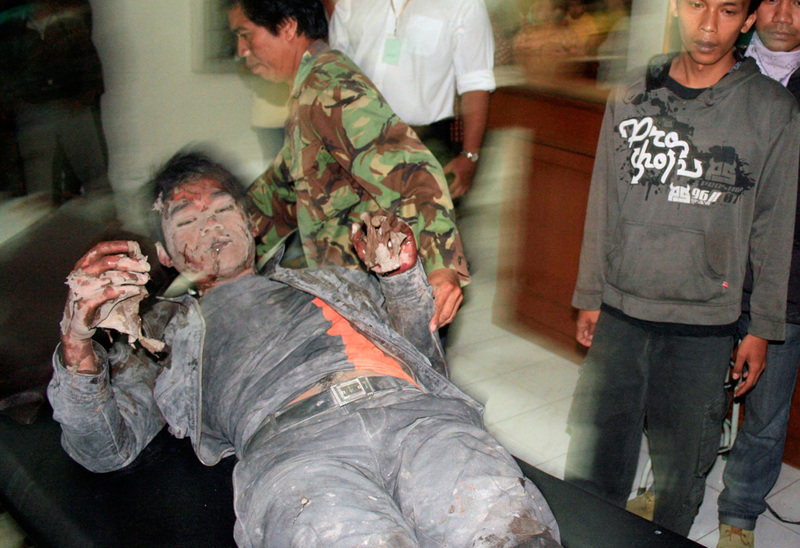 A man with injuries sustained from Mount Merapi’s latest eruption arrives at Sarjito hospital in Yogyakarta November 5, 2010. Dead cows killed in Mount Merapi eruption lie covered in volcanic ash in Argomulyo, Yogyakarta, Indonesia, Nov. 5, 2010. Rescuers carry the body of a victim of Mount Merapi eruption in Argomulyo, Yogyakarta, Indonesia. Victims of Mount Merapi eruption lie covered in volcanic ash as rescuers search for others in a village that was hit bypyroclastic flow in Argomulyo, Yogyakarta, Indonesia, Nov. 5, 2010. The hand of a Mount Merapi eruption victim is seen at a hospital in Yogyakarta, Indonesia, Friday Nov. 5, 2010. A deadly surge of blistering gases cascaded down the slopes of Indonesia’s most volatile volcano, torching houses in one mountainside village. 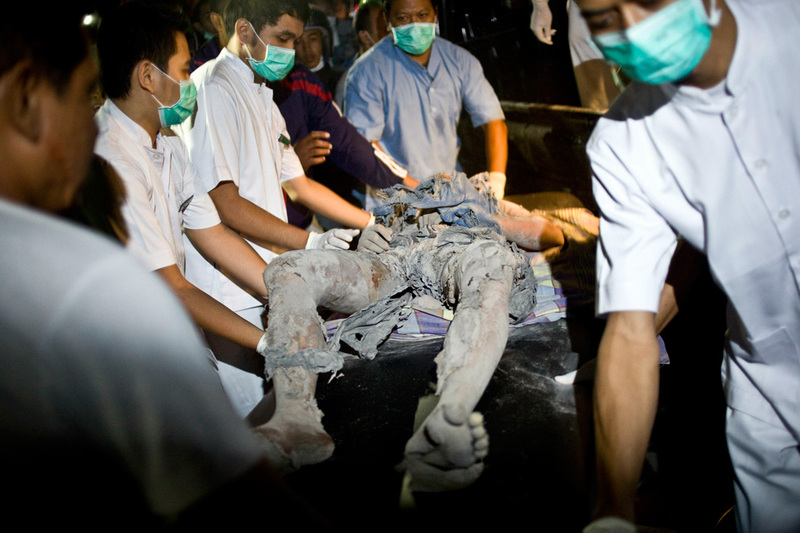 Rescuers carry the body of a victim of Mount Merapi eruption in Argomulyo, Yogyakarta, Indonesia, Nov. 5, 2010. 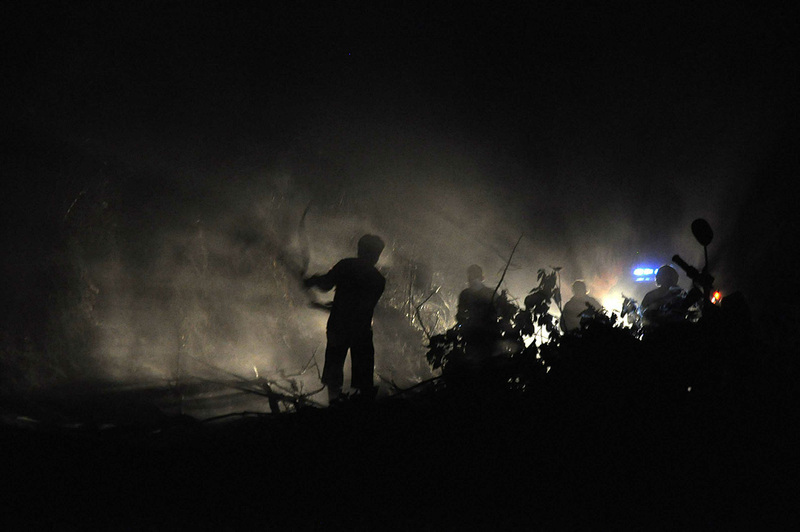 Indonesian soldier and rescuers run after an eruption of Mount Merapi in Argomulyo, Yogyakarta, Indonesia, Friday, Nov. 5, 2010. MOUNT MERAPI, Indonesia – Searing gas avalanched down an Indonesian volcano with a thunderous roar, torching houses and trees and incinerating villagers as they fled Mount Merapi’s worst eruption in a century. Dozens of bodies found Friday raised the death toll to 122. The injured — with clothes, blankets and even mattresses fused to their skin by the 1,400 degree Fahrenheit (750 degree Celsius) heat — were carried away on stretchers following the first big explosion just before midnight. Soldiers joined rescue operations in hardest-hit Bronggang, a village nine miles (15 kilometers) from the crater, pulling at least 78 bodies from homes and streets blanketed by ash up to one-foot (30-centimeters) deep. Crumpled roofs, charred carcasses of cattle, and broken chairs — all layered in white soot — dotted the smoldering landscape. Merapi was active throughout the day Friday. The volcano, in the heart of densely populated Java island, has erupted scores of times, killing more than 1,500 people in the last century alone. But tens of thousands of people live on its rolling slopes, drawn to soil made fertile by molten lava and volcanic debris. Its latest activity started Oct. 26. After Friday’s explosion — said by volcanologists to be the biggest since the 1870s — officials announced by loudspeaker that the mountain’s danger zone had been expanded to 12 miles (20 kilometers) from the crater. “The heat surrounded us and there was white smoke everywhere,” said Niti Raharjo, 47, who was thrown from his motorbike along with his 19-year-old son while trying to flee. “I saw people running, screaming in the dark, women so scared they fell unconscious,” he said from a hospital where they were both being treated for burns. The greatest danger posed by Merapi has always been pyroclastic flows — like those that roared down the southern slopes at speeds of up to 60 miles per hour (100 kilometers per hour). With bodies found in front of houses and in streets, it appeared that many of the villagers died from the searing gas while trying to escape, said Col. Tjiptono, a deputy police chief. More than 150 injured people — most with burns and some with respiratory problems, broken bones and cuts — waited to be treated at the tiny Sardjito hospital, where the bodies piled up in the morgue, and two other hospitals. “We’re totally overwhelmed here!” said Heru Nogroho, a spokesman at Sardjito. Despite earlier predictions that dozens of big explosions that followed the initial blast last week would ease pressure building up behind a magma dome, eruptions have been intensifying, baffling experts who have long monitored Merapi. In terms of the amount of volcanic material released — 1,765 million cubic feet (50 million cubic meter), “it was the biggest in at least a century,” said Gede Swantika, a state volcanologist, as plumes of smoke continued to shoot up more than 30,000 feet (10,000 meters). More than 100,000 people living along Merapi’s fertile slopes have been evacuated to crowded emergency shelters, many by force, in the last week. Some return to their villages during lulls in activity, however, to tend to their livestock. They were told to stay away on Friday. Even scientists from Merapi’s monitoring station were told they had to pack up and move down the mountain. They were scrambling to repair four of their five seismographs destroyed by the heavy soot showers. Before Friday, the death toll from Merapi stood at 44, with most dying in the Oct. 26 blast. With the new deaths around the village of Bronggang it climbed to 122, the National Disaster Management Agency said on its website. In 1994, 60 people were killed by Merapi, while in 1930, more than a dozen villages were torched, leaving up to 1,300 dead. A woman prays at a temporary shelter for those who are affected by the eruption of Mount Merapi in Yogyakarta, Indonesia, Friday, Nov. 5, 2010. Blistering gas from Indonesia’s most volatile volcano spewed farther than expected Friday, incinerating houses at the edge of the danger zone, triggering chaotic evacuations and pushing the death toll above 100. Volunteers and soldiers carry the body of a victim of Mount Merapi eruption at Argomulyo village, Cangkringan, in Sleman November 5, 2010. Indonesia’s Mount Merapi volcano erupted with renewed ferocity on Friday, bringing the total death toll to over 100 and blanketing the area with white ash. A woman shields herself and her child with an umbrella during an ash rain while they walk to their tent at a temporary shelter in Jumoyo village in thecity of Magelang November 5, 2010. A villager covers her head with a plastic sheet during an ash rain at a temporary shelter in Jumoyo village, in the city of Magelang November 5, 2010. 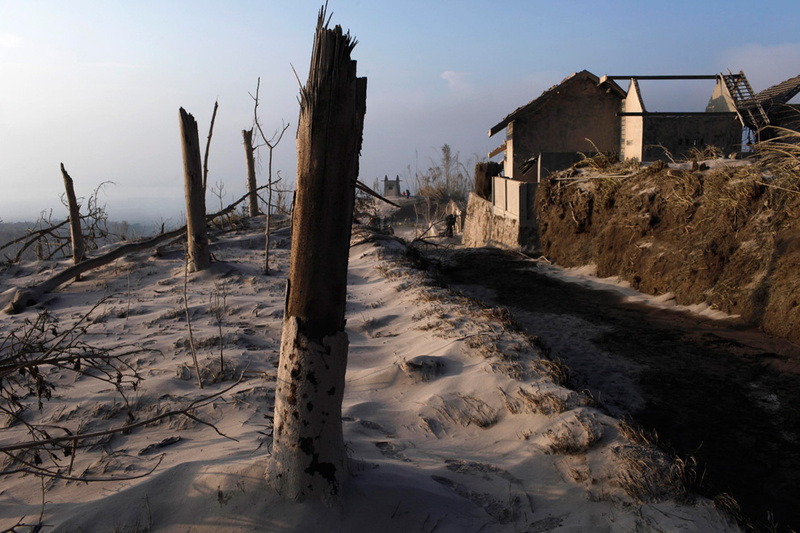 In this photo taken on Nov. 1, 2010, a melted radio-cassette tape recorder lies covered with volcanic ash from the eruption of Mount Merapi in the abandonedvillage of Kaliadem, Yogkakarta, Indonesia. In this photo taken on Nov. 2, 2010, a pair of slippers lies covered in volcanic ash from the eruption of Mount Merapi in the abandoned village of Kaliadem,Yogyakarta, Indonesia. In this photo taken on Nov. 2, 2010, a pet bird killed during the eruption of Mount Merapi remains in its cage in the abandoned village of Kaliadem, Yogyakarta. Children carry an umbrella to shield themselves from ash as they walk among ash-covered tents at a temporary shelter in Jumoyo village in the city of Magelang. A woman carries her grandchild after arriving at a temporary shelter in Maguwoharjo Stadium In Yogyakarta, November 5, 2010. A red cross volunteer holds an elderly woman as she arrives at a temporary shelter at Maguwoharjo Stadium In Yogyakarta, November 5, 2010.